"You enter Ebonheart, also known as the Black City. To the north you can see the red-orange glow of Dagoth Ur, the firecone on the Black Isle. This city's ruler has a reputation of being extremely ruthless..."
Ebonheart is a city-state located in central Morrowind. The ruler is King Casik. Its rivals are Blacklight, Firewatch, Kragenmoor, and Mournhold. 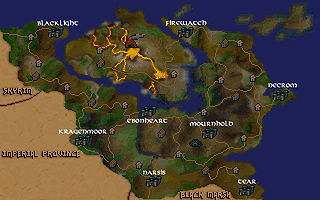 Ebonheart is a possible starting location for Dark Elves. This page was last modified on 3 February 2019, at 12:19.